2015 Road Trip Photos #30: The Jazz Shopper « Midlife Crisis Crossover! 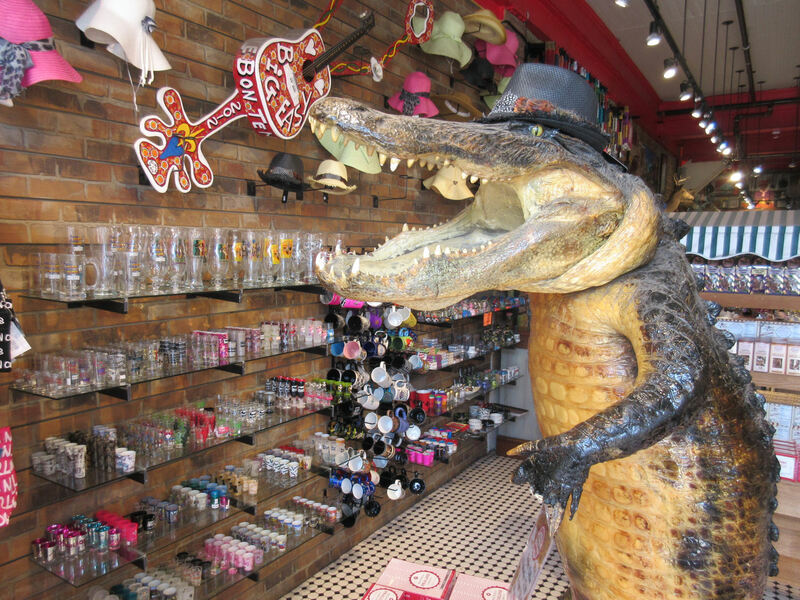 This glass-hawking gator in a fedora thinks you need to drink more. What could possibly go wrong? 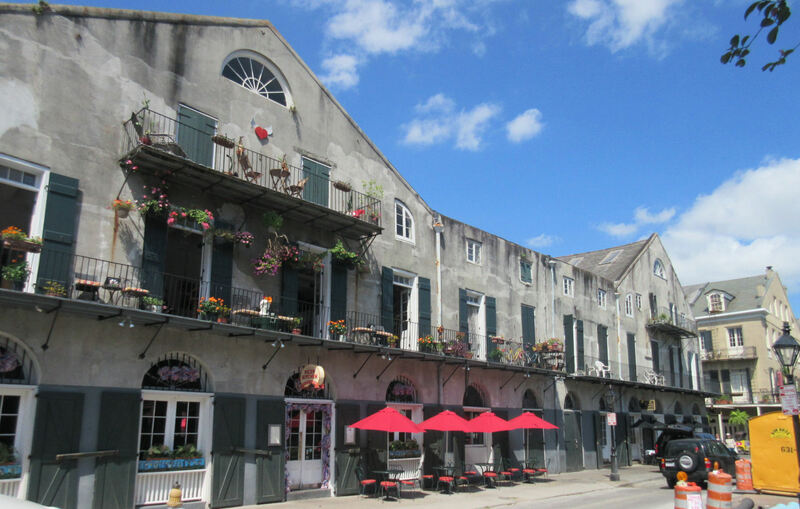 The French Market strives to attract your attention for all your New Orleans souvenir needs, but French Quarter shopping and culture don’t end there. Across the street, around the block, art and commerce dot the sidewalks and lure in tourists starved for a change of pace from their milder, blander hometowns. 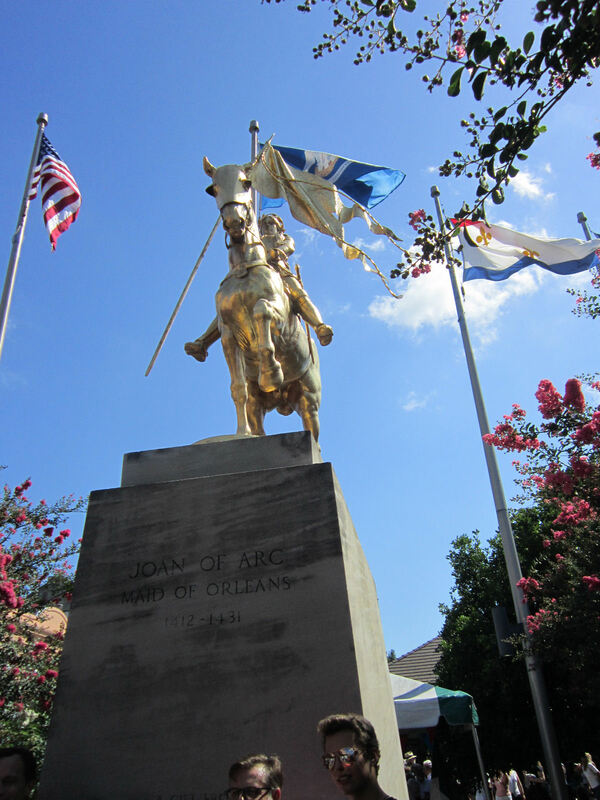 We saw Joan of Arc earlier that morning at the St. Louis Cathedral, but just up the street stood a second version of the French legend, shinier and astride a mighty steed. Her horse would’ve become more famous, but it plea-bargained its way out of being burned with her at the stake. For some reason an upscale soiree was in progress behind and around Joan, folks enjoying drinks and mingling and crowding out us outsiders. We infiltrated their ranks to take a couple of shots and escaped their attention, probably because we didn’t try to sneak any free drinks. 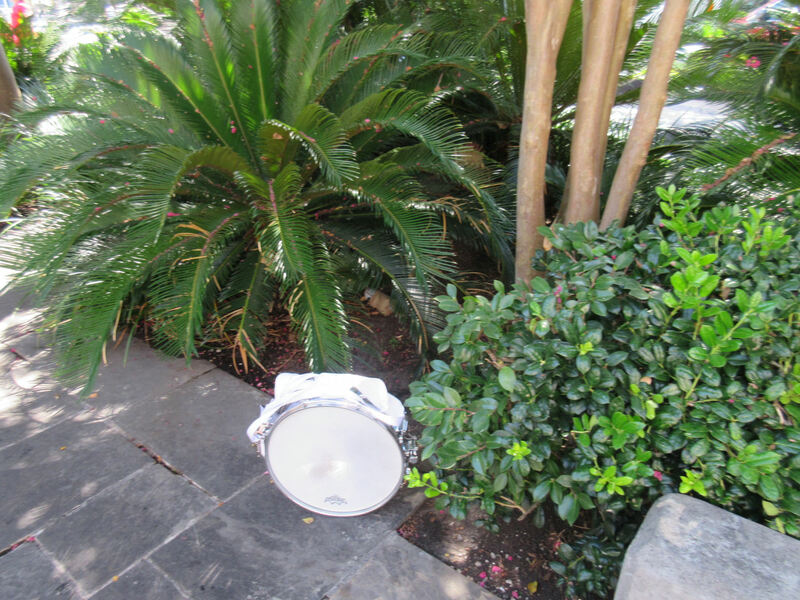 Curiously, someone in their ranks — or perhaps a previous, unrelated visitor — abandoned a tiny drum on the ground next to the flora surrounding dear Joan, possibly because someone declared bass drums too gauche. Or maybe this once belonged to a young lad whose tragic life was like a Tiny Tim/Little Drummer Boy mashup. And maybe the party was actually a wake in his belated honor. Now I’m really sad and I don’t like this theory. 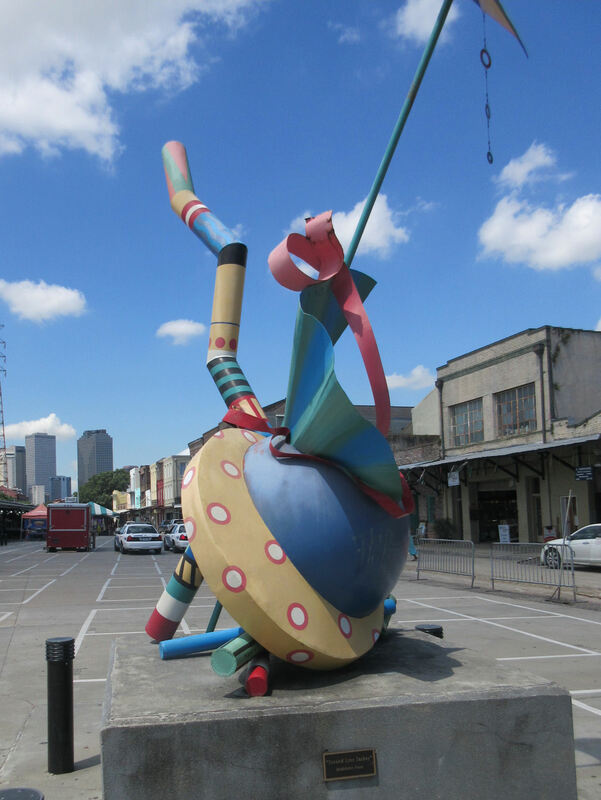 Down by the Old U.S. Mint is a much happier sculpture, Madeleine Faust’s 2009 “Second Line Sashay”. This would’ve been a much more appropriate wine party centerpiece, except there was no convenient shindig shelter nearby. 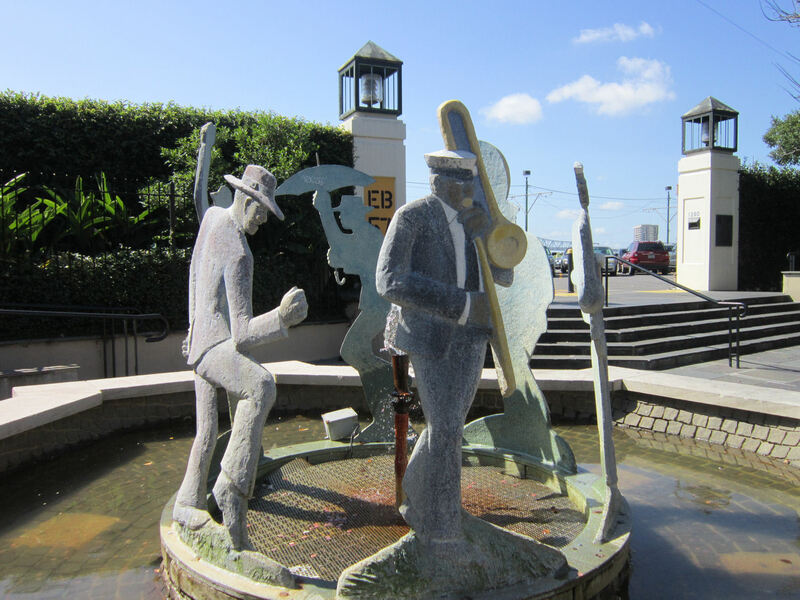 Over by the banks of the Mississippi River, stone jazzmen greet anyone courageous enough to drive into the French Quarter and use their parking lot. Or they’re an insidious offshoot of the Weeping Angels. Keep your eyes and ears wide open just in case. Past a certain point, French Quarter stores and homes begin to blend together, and it’s hard to tell when to stop browsing and turn around. 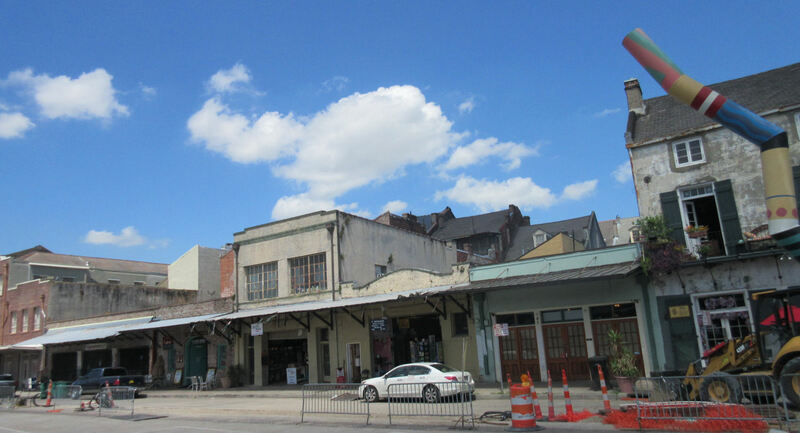 The buildings are equally vintage, no doubt still bearing witness to the ravages of time and the scars of Katrina. We think we may have seen a jazz funeral in progress later that evening. 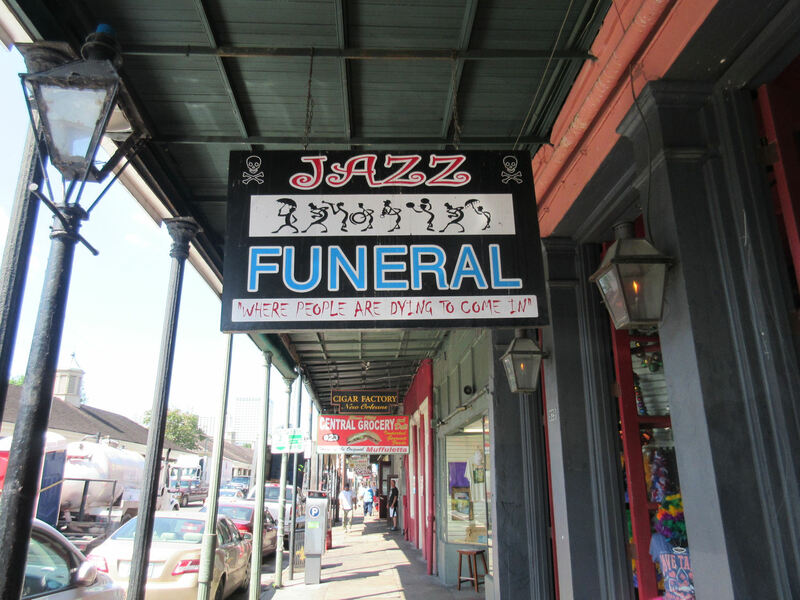 I guess they need to obtain jazz funeral supplies somewhere. 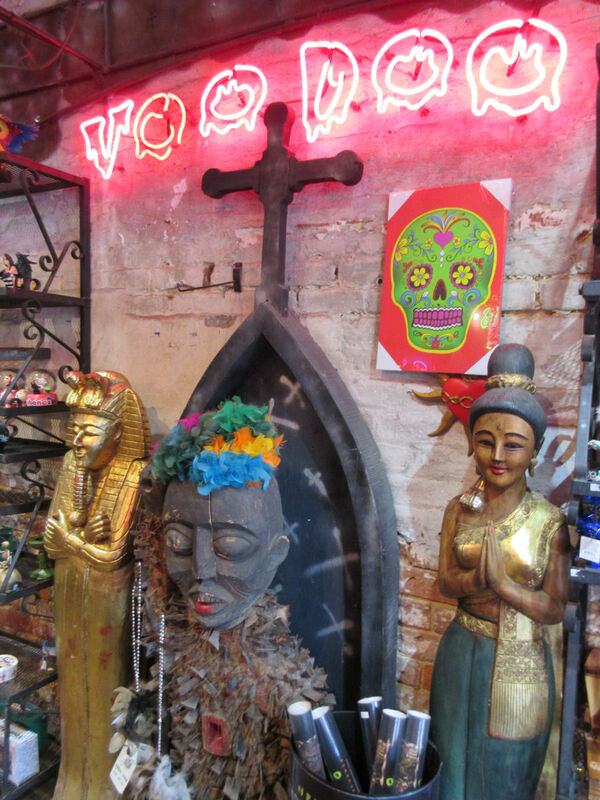 The store contains numerous merchandise collections for visitors to peruse and pick out something to take home for a price. Some of them, we wondered if the cost would be more than just money. Some of their collections were eye-catching but, uh, not our thing. Y’like hot sauce? I think they sell ALL OF THEM. Plenty of flavorful culinary painmakers at your disposal. They’re probably all equally authentic, or at least culturally superior to basic Tabasco. If you chose poorly and damaged your tongue, along another wall are your emergency salves, by which I mean bottled drinks. 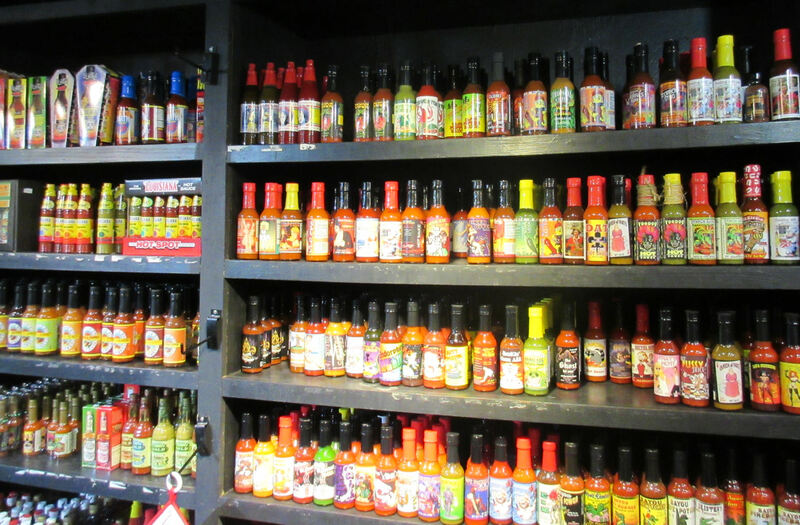 These also help combat the torrid temperatures outside, but in here the hot sauces are the more immediate danger. For those having too hot of a hot time in the old town tonight. 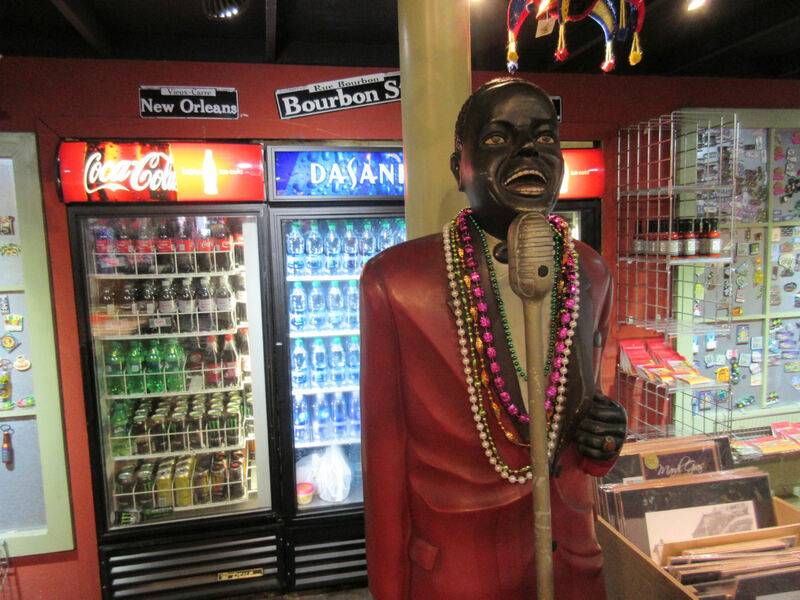 Up at the counter, don’t forget to choose a Mardi Gras mask and a music sampler to prove to your loved ones back home that you were indeed in New Orleans. Ideal for any occasion. If other partygoers stare at you, inform them they’re the ones who’re out of style. Other stores on the block have their own memorable displays vying for your attention and tourist bucks. 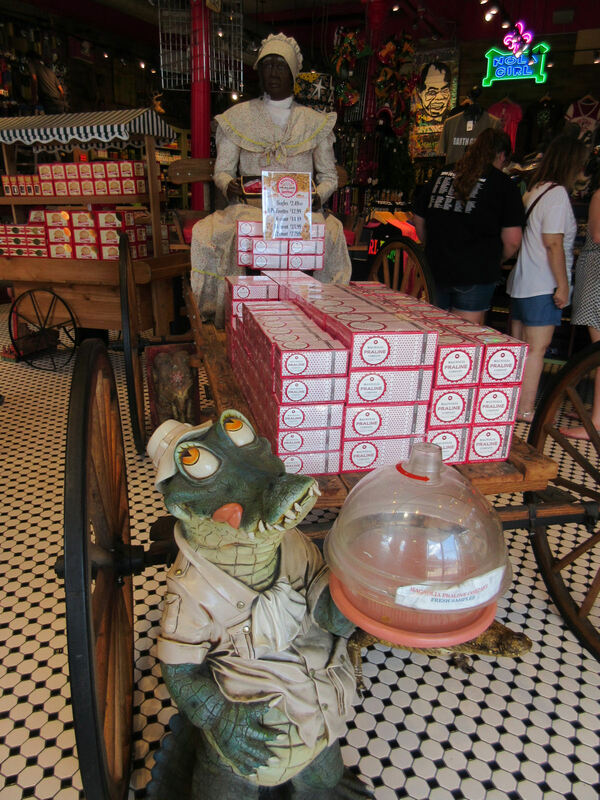 If you prefer sweetness to hotness, this charming gator thinks you need a box of pralines — i.e., nutty caramel candies softer than cookies and richer than mere peanut butter. If beignets aren’t doing it for you, pralines are New Orleans’ best Plan B.
Protip: they pronounce it PRAW-leen. If you ask for a PRAY-line, they know you’re an outsider and they sneer at you like a Manhattan hot dog vendor who’s just been asked for ketchup. That first gator is a very dapper gator compared to the last goofy gator. The first stone jazzman in the middle looks like a jazzmermaid. Now that you mention it, the trombonist’s feet and base do look finny. Gator #1 definitely has the classier chapeau, but #2 earns points for trying to compensate with an ascot.